I cannot fully convey how happy we are with the kitchen remodel we had done by Paul Califari, Tanja Albright, and the construction team at DreamMaker Bath and Kitchen. 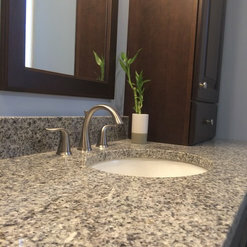 From our initial contact with Paul to the final day of installation, Paul and his team were professional and eager work in partnership with us to meet our needs, desires, and budget. 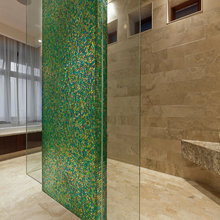 Tanja's design brought a creative vision to maximize the beauty and functionality of our space. 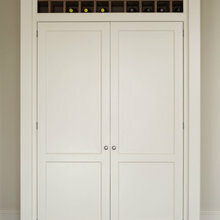 Her attention to detail, sensitivity to our budget, and keen design sense were invaluable to the success of our project. Paul's construction crew was courteous and professional, taking care to minimize dust and debris at the worksite and leaving the property neat every day. When the inevitable glitches of the project arose (and there were very few), Paul communicated with us immediately about the nature of the problem and the steps already taken to resolve it as quickly as possible. The entire project, from tear down through final inspection, took under 5 weeks because of Tanja's and Paul's meticulous planning. 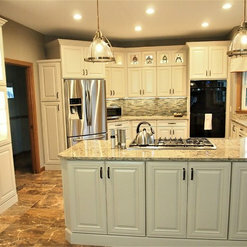 Thanks to Paul and Tanja, I can say that we would change nothing about our new kitchen - it is just perfect! We are working on room number 6 with DreamMakers! Tanja has been our designer throughout; she and the whole staff at DreamMakers have been professional and skilled. Paul, the owner, is a perfectionist and is on the scene to add his expertise. 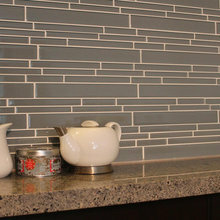 We used 700 square feet of large tile for our project, and Paul and the team spent time looking at all the options to choose the best layout so that doorways and transition areas were not awkward. We can't recommend them highly enough! From my first meeting with Paul, the owner, it was clear that he listens to his clients to understand exactly what they are looking for. 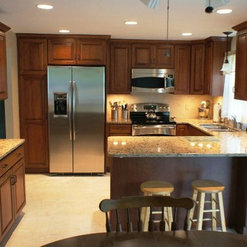 He carefully explained what would need to be done to make the renovations I wanted and what it would cost. While it was more than I had hoped for, it was definitely worth it for the quality, the convenience, and the personal touches of the project. 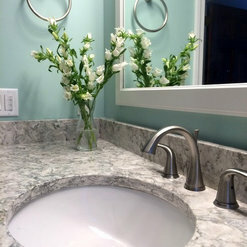 Peter, the designer, worked with me to maintain the aesthetics of my 1920's bungalow but with all the modern conveniences. John, the master carpenter who was onsite, was very professional and worked at keeping the rest of the house clean and protected as well. My job was done on budget, on time, and was actually a lot of fun. 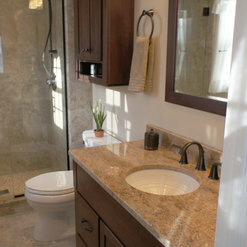 It's so beautiful now I wish I could spend more time in the bathroom, it's my favorite room of the house! Thank you everyone at Dream Maker! Paul, Tanja, Frank, Sean and John were all excellent t work with. They were patient and kind with the many questions we had and walked us through the many different steps of redesigning a kitchen. They guided us on the practicality and functionality of what we were looking to have and the end result is a beautiful kitchen, which is now open to our dining room. 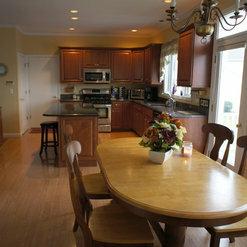 It has allowed us to use our kitchen as more than just a place to cook food, it's now a living space. The work was well done and every day they let us know what the plan was for the next day, which was very helpful. I miss seeing and talking with them, but with the beautiful work they've done, we will always remember them fondly. 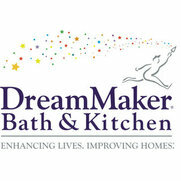 I highly recommend DreamMaker Bath & Kitchen. 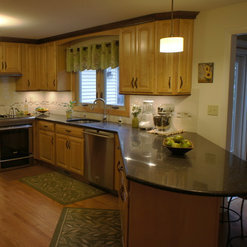 They refaced the cabinets in our kitchen and half bath, replaced our floor and painted both rooms. Our experience with them was great. They are professional, detail oriented and do what they say they're going to do on time. Working with Paul, the designer, went very smoothly. We were able to get what we wanted within our budget with suggestions from Paul. DreamMaker was an excellent choice. 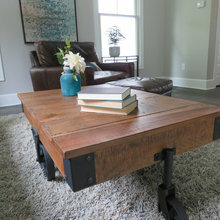 The experience was positive from the design to the finished product. Each person was professional and friendly. 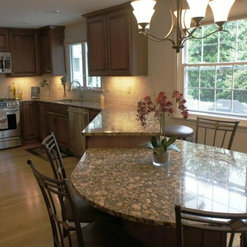 Most important, the staff was respectful of my home, minimizing the effects of the renovation as much as possible. The job began ahead of schedule and was done in the time range given. I appreciated the constant communication and the fact that the owner was on site to check on progress. 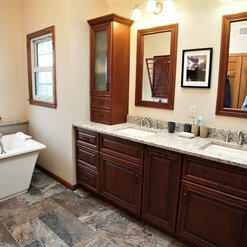 My Master Bath turned out exactly as I wanted and I will enjoy it for many years! 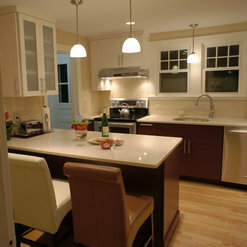 Guidance in layout, colors and helping us to discover what future owners may like in a kitchen were the objectives that we were looking for in a kitchen remodeler. We found just that and more in Paul at Dreammaker. While helping us to find styles and colors we liked, they kept us advised of the price of our choices and kept us from making color mistakes. We were very happy with the construction process. We were amazed at the speed of the demolition and that the team contained the dust quite well. Their team worked hard to stay on schedule and actually finished a bit ahead! They were great in helping us through changes to the plan that we or they found necessary. Their new layout gave us more room so we are no longer bumping into each other and made the room seem so much bigger. 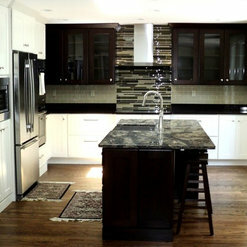 We have gotten many complements on the kitchen remodel especially on the back splash and counter space. All in all they did a great job that we have been happy to show off. Commented: Kitchen CabinetsI also agree, do nothing. Let the new homeowner decide. You never know, they might love it!! 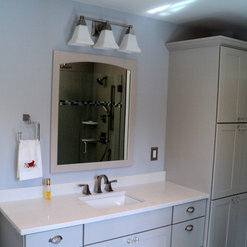 Commented: Where is the vanity fromThis is a semi-custom vanity from Showplace Cabinetry.